Majestic Colonial Junior Suites: All Junior Suites are beautifully appointed to exceed your vacation needs. Each suite is furnished with one romantic King, four post bed or two comfortable queen size beds. All suites have a balcony or terrace to enjoy the beauty of the tropical climate while still in the intimacy of your room. When the gentle breezes are not enough to cool you off the rooms are equipped with air conditioning and a ceiling fan. A Jacuzzi tub for two and luxury shower provide for a truly pampered feeling without ever leaving your room. Satellite TV, in-room safe, coffeemaker, iron and ironing board provided in the suites make for a hassle free vacation. For extra comfort all rooms are furnished with an extra sitting area with sofa. 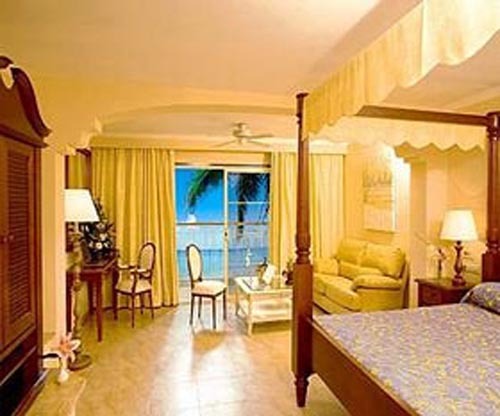 Majestic Colonial Junior Suites are available with Gardenview or Oceanview.